In this section I have gathered many common Japanese phrases that teachers used in the classroom frequently. You will notice that in the classroom teachers like to use certain specific phrases more often, like 覚えてください (oboete kudasai - Please remember), もう一度言ってください (mouichido itte kudasai - Please say it again), etc. If you are taking some Japanese courses or if you are planning to study in Japan, you will find the following list very useful. Take a look and see how many of the phrases do you recognize. Take some effort to remember them and I am sure you will find them useful. You don't have to know these common Japanese phrases all at once. Just come back to this page regularly to refresh your memory. OK, let's explore the list. shitsumon wa arimasenka Do you have any question? shitte imasuka Do you know? Of course there are other common Japanese phrases used in the classroom. The above are just what I have compiled so far. I will update this list of common Japanese phrases when I find more of them. 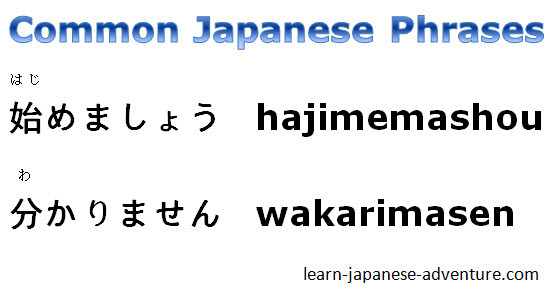 And if you think the above phrases are too simple and looking for more, there are some online Japanese courses that you can learn more commonly used phrases.